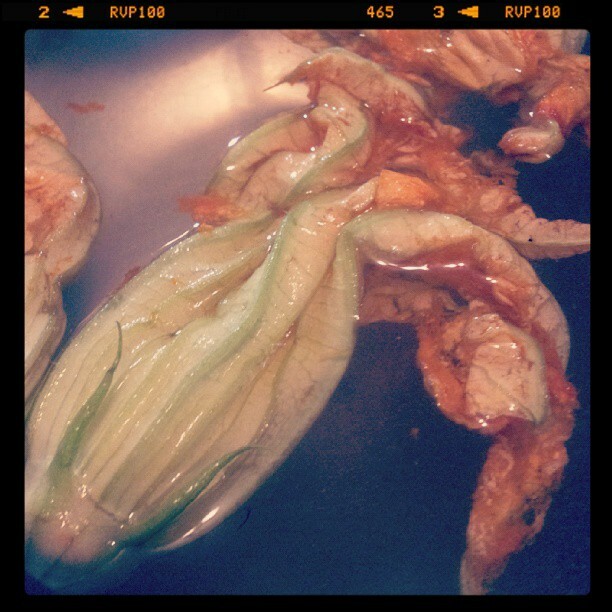 From funky to fresh; A tale of local love, NY wine and zucchini blossoms. I have two loves, NYC and the Hudson Valley. For years I’ve lived with time split between the two, passing through the hell of Times Square and Port Authority on my way in or out of the city. My trip has changed a lot in the last twenty years, on both ends. On the way upstate, urban sprawl has turned a ride once filled with vast open spaces into a journey riddled with stops at commuter park and rides and bus shelters. I’m lucky to be a bit removed and closer to the green fields, farms and wineries. On my way out of the city, Times Square’s dens of iniquity have been replaced by Disney stores and public seating areas. Try as they might to erase all signs of this once harsh, gritty section of old NYC there remains quite of bit of funkiness in Port Authority. Sure, its cleaner and smells a bit better, but it comes nowhere close to the transformation that has happened in the surrounding area. Last week, I arrived at Port Authority looking forward to a brief escape planned with friends at Whitecliff Vineyard in Gardiner, NY. I suddenly found myself astonished by some goings on in the North lobby! Seriously, over the years I’ve witnessed a vast number of hair-raising, nose curling, mind-blowing scenes at Port Authority. Back in the 80s, it wasn’t uncommon to see or smell something that burned your retinas or olfactory senses for days after. 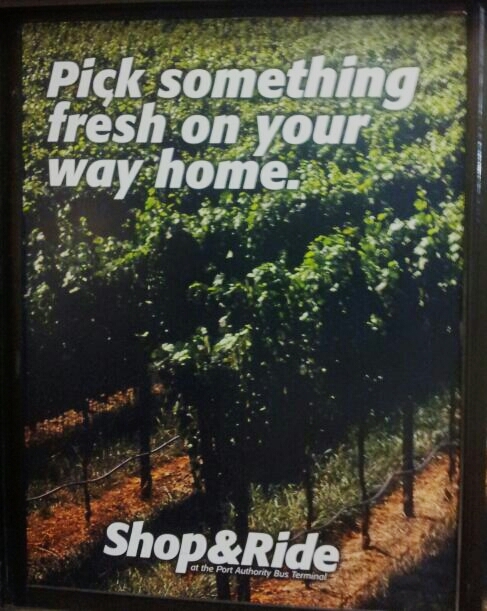 It wasn’t exactly a place you associated with freshness. Unless of course you count a quick sitz bath amongst the bag ladies living in the loo. Bringing some local love to commuters! Well, to my surprise my current mind-blowing scene explored a whole new form of freshness available in Port Authority, a Thursday farm stand filled with local love from farms in Milton, NY, in the Hudson Valley! While this is no Union Square Farm Market or Smorgasburg you can find some tasty treats including seasonal finds like donut peaches, cider donuts, artisan granola and freshly baked breads. 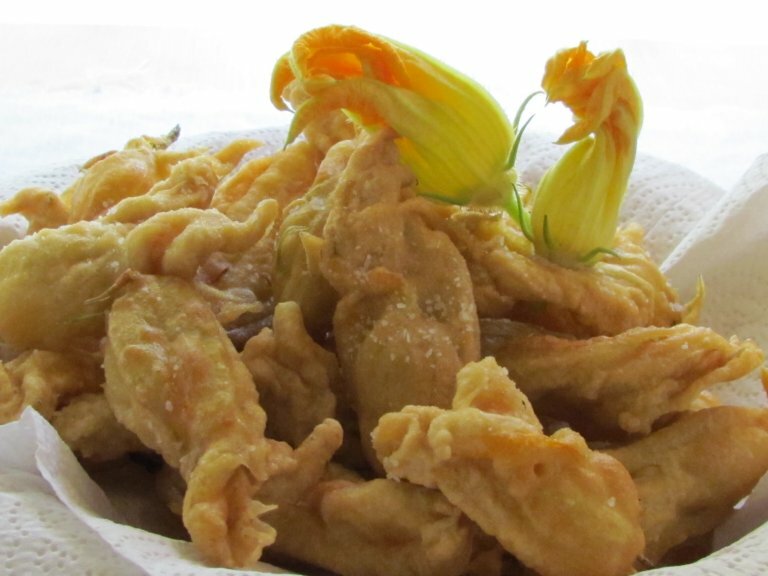 I was delighted to score a bag of zucchini blossoms, a rare find and perfect for pairing with a few of the deliciously, refreshing whites I planned on picking up at Whitecliff! As I stashed my booty in my bag I thought how odd it was that I’m bringing these goodies back to their home turf to be enjoyed. At least I’m using mass transit to help lower the carbon footprint. friends at Whitecliff Vineyards. Nestled beneath the majestic wall of white stone cliffs of the Shawangunk Mountains Whitecliff offers not only great wine but one of the most breathtaking views of the Hudson Valley from the back deck of their tasting room. Husband and wife team of Yancey Stanford-Migliore and Michael Migliore started planting in 1979 to discover which varieties where best suited to withstand the harsh winters and often high humidity in summer. 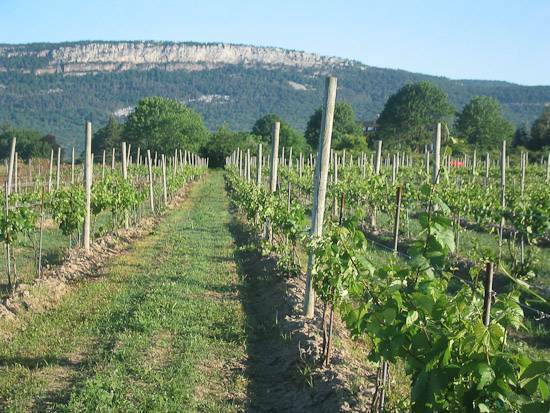 Today they grow over 20 different grapes including Pinot Noir, Chardonnay, Cabernet Franc, Traminette and Seyval Blanc. Their passion, hard work and attention to detail have paid off, and it’s detected in every sip of their wine. It’s a must visit for this city dweller when on a culinary journey through the rolling hills of the Hudson Valley. I’m a big fan of their crisp whites and their locally grown Gamay, but was looking forward to tasting their current selection! 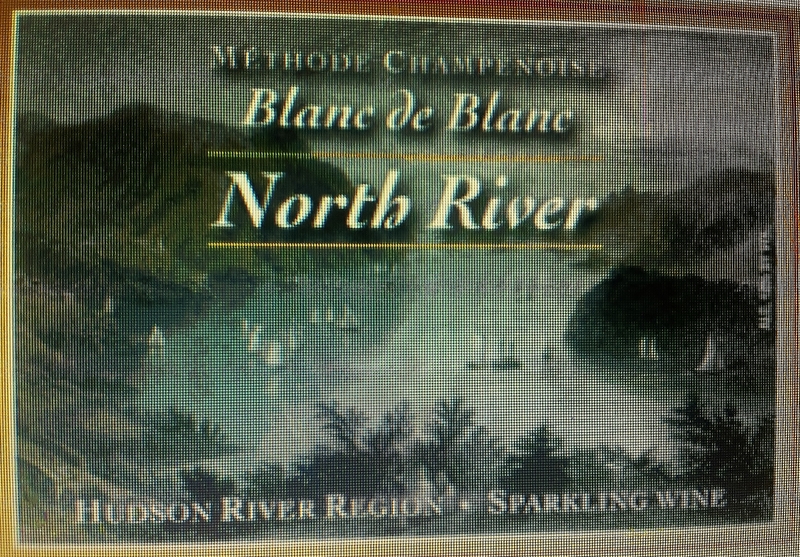 Lucky for us that Yancey was in the tasting room to give us a sneak preview of their newest offering, North River, Blanc de Blanc, Hudson River Sparkling Wine. 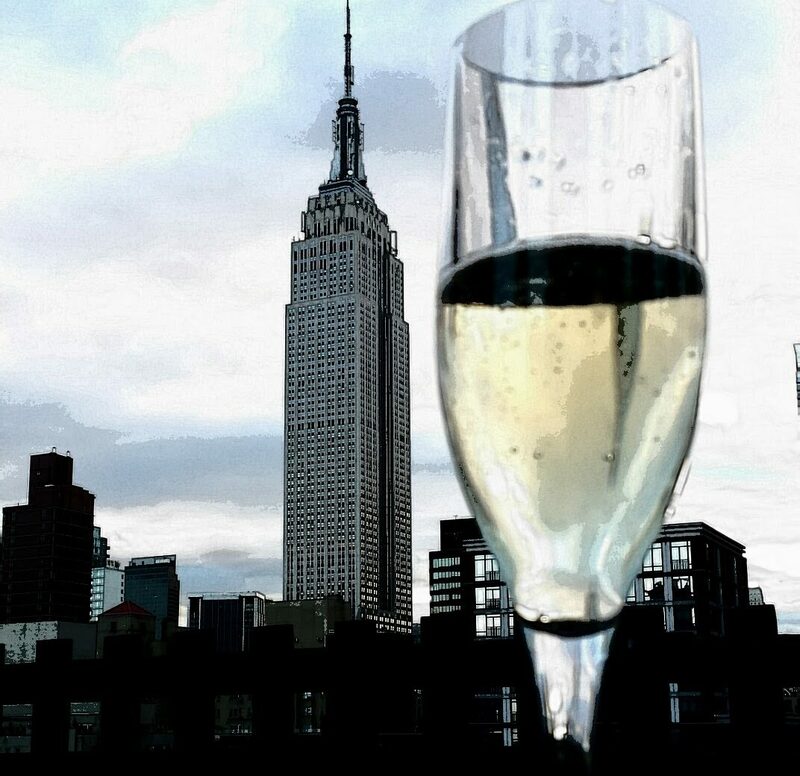 It’s made with 100% estate grown Chardonnay, produced using Méthode Traditionelle, a second fermentation in bottle developed in the Champagne region of France and spending 18 months on the lees (spent yeast cells) to gain a creamy complexity. Its bright acidity coupled with a kiss of toasted brioche won me over, and would be the perfect accompaniment to how I planned to prepare the blossoms I scored earlier in the day. Later that evening I found myself in locavore heaven! North River’s tiny bubbles cut through the warm, silky cheese hiding within my golden brown zucchini flowers and paired well with the slightly salty batter. It also complemented the array of local cheeses and jams I served along with our first course. Although North River won’t be released until September I urge you to seek out a bottle of Whitecliff’s other offerings available in many shops in both the Hudson Valley and in NYC. Step 1. Soak blossoms in ice water to keep fresh (up to two days). This will also help the flower to open. 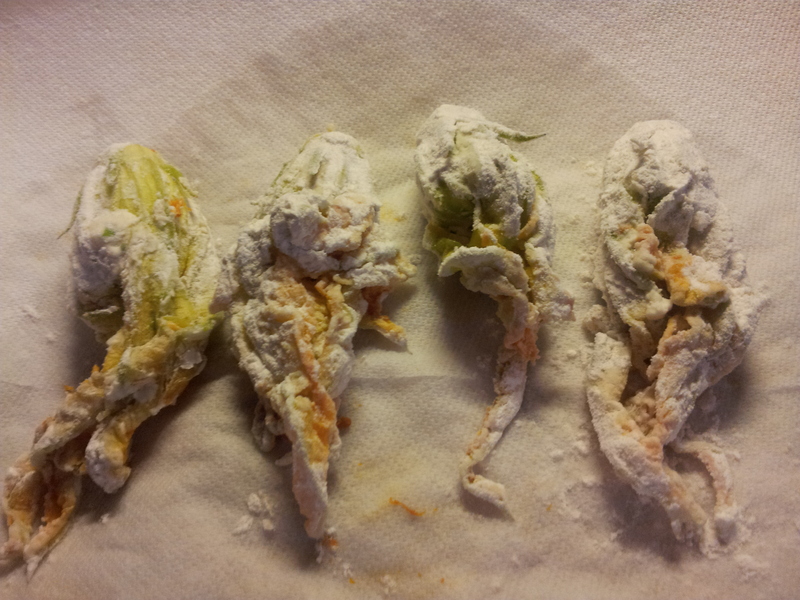 Remove from ice bath, pat dry, make a small slit along 1 side to open and remove stamen (the little slender nub connected to inside of blossom). 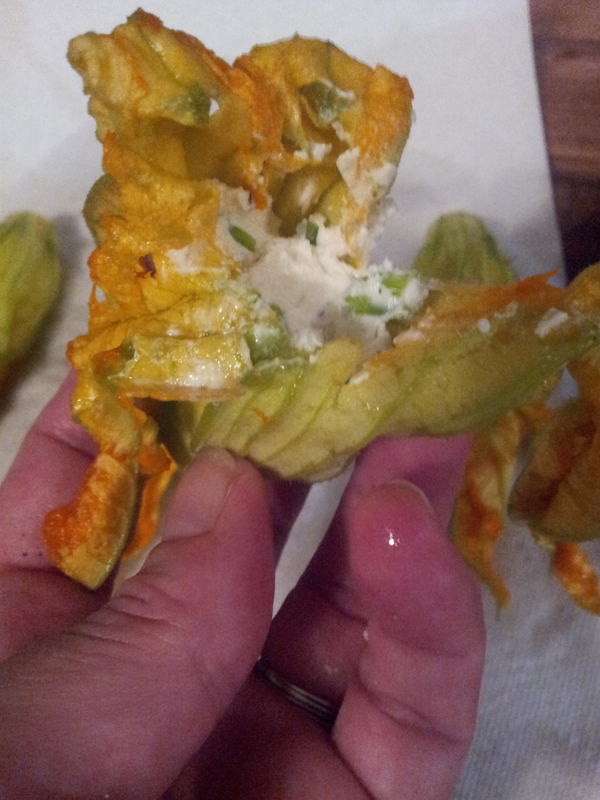 Stuff with just enough cheese to fill inside of blossom leaving room to twist and close seam. After twisting lightly dust with sifted flour seasoned with a pinch of salt and white pepper. Mix remaining flour and club soda till smooth. Heat canola oil in fry pan on medium heat till you see a slight bubble, around 250. 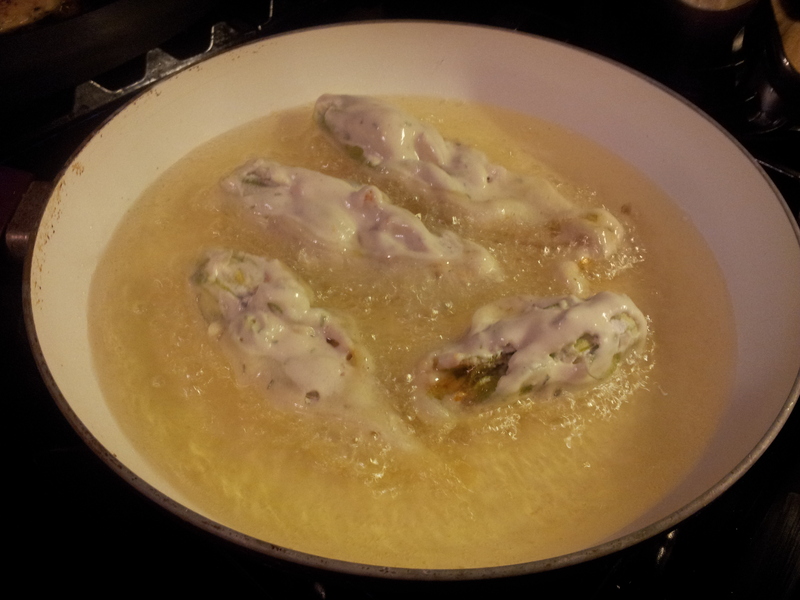 Dip each blossom in batter to prepare for frying. Make sure you use enough oil, blossoms should float in pan, 1/2 inch deep works well. 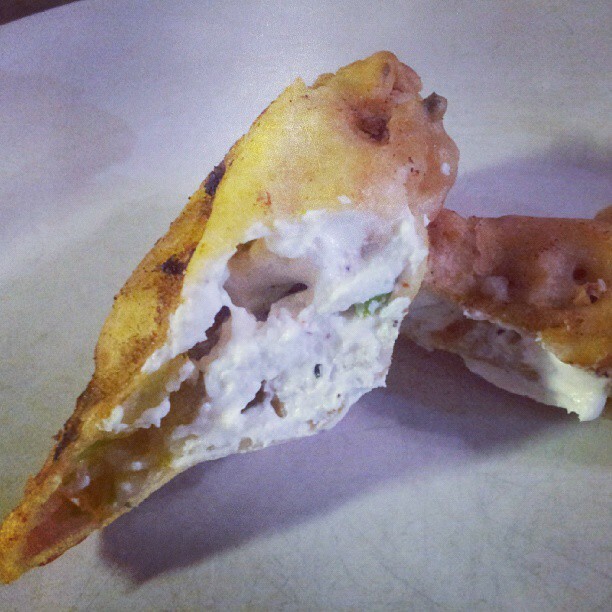 I test frying temperature by putting a small amount of batter in pan. If not hot enough you will end up with heavy, greasy blossoms. Turn when golden brown being careful when you flip them over.